The Line 6 Helix LT guitar processor offers high performance amp modelling with an easy-to-use interface. Its slick hardware delivers a top level performance every time thanks to the award-winning HX Modelling engine. Replicate amps, cabs, mics and effects and you will be astounded as to just how real they sound. This is without doubt one of the most powerful guitar processing platforms on the market right now. The Helix LT guarantees an excellent playing experience as it gives you even more DSP power than any other multi-effects processor around. The HX Modelling engine allows you to recreate a plethora of authentic tones, from tube amps to cabs, mics or effects. You can customise impulse responses to suit your rig and tweak them as you wish. As we have come to expect from Line 6, the Helix LT provides ultimate sound quality and offers 123dB of dynamic range. The Helix LT offers 50 guitar amp models, 12 bass amp models, 37 cabs, 16 mics and 104 effects - a huge choice. For many performing artists, it can be distracting to have to stop what you're playing to make a sound edit. 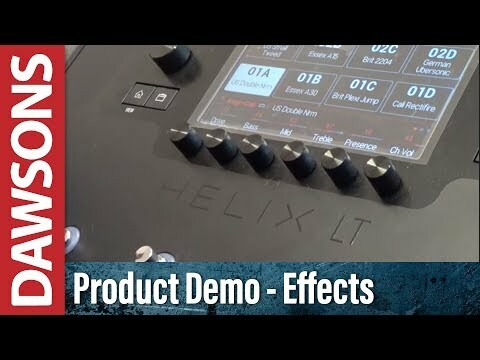 Not anymore with the Helix LT. Line 6 have designed their Helix products with the guitarist in mind, so the Helix LT lets you make amendments to your sound while you are still playing. You don't have to stop, bend down and tweak the knobs, you can use your foot with Pedal Edit Mode instead and adjust values with the expression pedal. Routing possibilities are endless thanks to the LT's robust I/O configuration built for both the stage and recording studio. Line 6 have designed the Helix LT to be easily integrated into your setup, plus it is compatible with other Line 6 products. The Helix LT has been designed to make life easier for the guitarist when it comes to laying down a recording or performing live. As such this guitar processor is incredibly easy to use. The interface is clear and intuitive for fast tone creation and access to all the sound parameters it has to offer. There are 12 footswitches to select and edit an effect block, and they feature colour LED rings around each one for ideal visibility. The Helix LT is compatible for use with Mac and PC, so you can see your work right in front of you on your chosen computer. Plus, Line 6 are always evolving their software to improve their products for every guitarist.